The Smithsonian Libraries and Smithsonian Gardens presented The Lost Bird Project exhibition from March 2014 – May 2015. Housed in the Smithsonian’s gardens, it featured large-scale bronze sculpture memorials of five extinct North American birds: the Carolina parakeet, the Labrador duck, the passenger pigeon, the great auk, and the heath hen. The Lost Bird Project dedicated one bird, the passenger pigeon, to remain permanently with the Smithsonian – in front of the National Museum of Natural History – close to Martha, the last passenger pigeon, who resides in the museum. 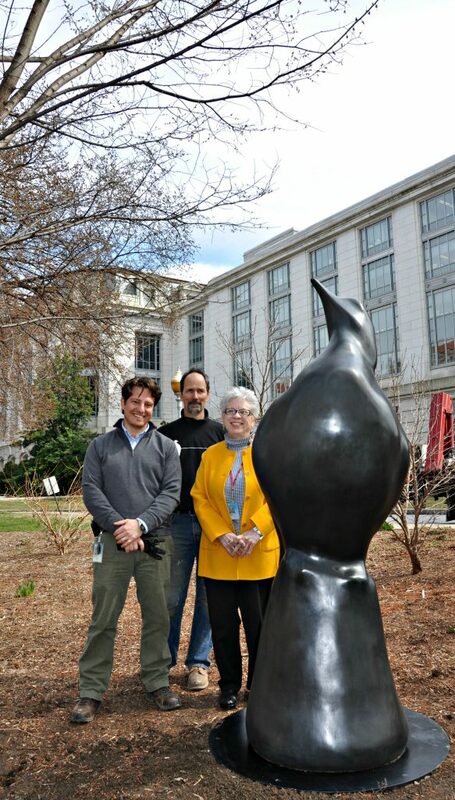 Jonathan Kavalier (Supervisory Horticulturalist, SI Gardens), artist Todd McGrain of The Lost Bird Project, and Susan Frampton with the passenger pigeon memorial sculpture in the Urban Habitat Garden.